It took me quite some time to find where to buy frozen berries in France. When I first arrived as a junior in college, I was an avid smoothie drinker – concocting one pretty much every day or so. Since I had other priorities that first year, I kind of let smoothie-drinking go by the wayside. When I moved back though (six years ago), finding appropriate ingredients, including frozen berries, became a major priority. I spent way too much time scanning the frozen food sections at an entire slew of grocery stores. I found all sorts of typical vegetables, like peas, spinach and potatoes (in an amazing amount of different types, shapes and sizes). I also found some more unusual items, such as leek patties and not-so-bad quiches. I, however, never came across frozen fruit. No strawberries, no blueberries, no mangoes, no cherries – nada. During berry season, I would stock up on my favorites (Mara des bois strawberries, for example) and freeze what would fit in our tiny freezer (I do mean tiny – it’s just as high as a pint of ice cream). The rest of the year, I was at a loss – and not getting my customary dose (or overdose) of phytochemicals. If I wasn’t so stubborn, I would have found the frozen berries sooner. But, I said “No, I’m not going to Picard.” This is a French chain-store that is wholly dedicated to frozen foods. I’d walk past it every day on my way home from the metro, and I’d imagine (in one of those scouring, devilish ways) what was inside: rows of ice-cold pre-packaged meals, just waiting to be taken home, thrown in the microwave and devoured in front of the television. That’s not why I came to France. This place was for those who didn’t cook – and that’s where I was a little wrong. While I still don’t like the idea of going into a huge white room that reminds me of the guts of a giant meat freezer, Picard has proved to be my organic frozen berry oasis. In addition to the ready-made meals, they have a large variety of pure and simple frozen fruits and vegetables – including organic ones. 1. Freezers consume electricity and create CO2. 2. There’s a lot of plastic packaging. 1. A full freezer uses less energy than an empty one. 2. Freezing helps reduce food waste. You only take eat what you need and keep the rest frozen until you need it again. Also, frozen produce tends to use more of a harvested crop. I guess it’s kind of a toss-up. If we could use low-energy consumption freezers and biodegradable storage containers, we might be okay. To help us contemplate, here’s one of my favorite recipes, using frozen (or fresh) berries. You can replace the fromage blanc with yogurt (yaourt brassé is a nice alternative in France). Fromage blanc is a fresh cheese the consistency of thick, creamy yogurt or sour cream. I love the wholesome taste of plain yogurt, but sometimes I want a dessert that makes me feel like I’m being naughty – yogurt is for good-girl days. The pure smoothness and lack of bitterness of fromage blanc is what makes it feel like dessert. Kind of like the way mascarpone works in tiramisu. The speculoos sprinkled on top add a sort of pre-holiday cheer to this simple dessert. Speculoos are Belgian spice cookies made with cassonade (dark brown sugar) and spices (i.e. cinnamon and cloves). They kind of remind me of ginger snaps. 1. If using frozen berries, cook them over medium heat and add a small amount of sweetener if desired. 2. In a small bowl, mix the fromage blanc with small amount of sweetener to taste. 3. 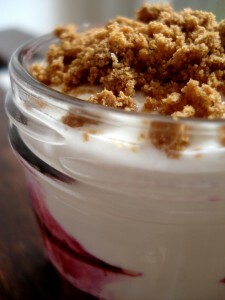 In a glass jar or other suitable container, layer the berries, the fromage blanc and broken pieces of speculoos. This entry was posted in Recipes (All) and tagged cheese, dessert, fruit. Bookmark the permalink.